The Geek Next Door: Borderlands 2 Mechromancer And More! Borderlands 2 Mechromancer And More! So the big news that hit yesterday was that the Mechromancer class (class number five) was given a release date of 16th October 2012. The Mechromancer will be FREE for Premier Club members (available free with most pre-orders) and will be around $9.99 (800 MS points for XBox) after release for non-members. 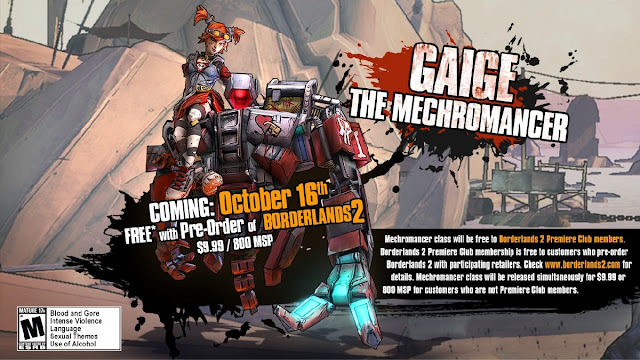 Gaige the Mechromancer will have her very own robot mech and Gearbox have been saying her skill tree will provide extra bonuses for use with her mech such as skill stacking (staking bonuses) for things such as extra damage. In other BL2 news, a few things have come to light that make us here VERY happy, you will be able to CUSTOM assign your controls so that you have your buttons where you want them (not like BL1 where tthe "use" button was not in the usual place of most games and took some time to get used to). This opens up for a much better game play experience as you will be able to stick that use button where you want as well as still offering pre-set configurations. The enemies you will be facing vary, but the big news around this is some monsters will "level up" if not killed straight away, this means if you hit one of these bad guys once, they grow and grow until they are potentially un-manigable and will tear through you and your party with ease. Unlike the Borderlands 1 game, the environment is not set mainly in a desert, there will be icy tundas, lava filled regions and green flowing pastures to explore. I'm even MORE excited now than ever before, only eight more days!